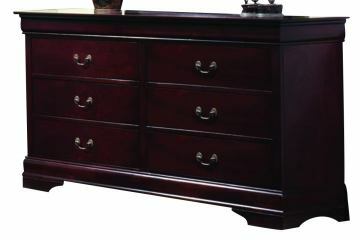 The Louis Philippe collection by Coaster Furniture is traditionally designed, yet updated with modern influences. The bed features a beautifully curved headboard and footboard contrasted by the clean lines of the feet and rails. All case pieces feature brushed nickel hardware, felt-lined top drawers, metal drawer glides and dovetail drawer construction to give you both style and functionality. The gorgeous cherry finish enhances the smooth texture and rich tones in the wood creating a warm and comforting look to create a stunning, traditionally-styled bedroom.